When journalist Robert Andrew Powell finished his first marathon, he cried, cradled in his father’s arms. Long distance runners understand where those tears come from, even if there are others who will never understand what drives someone to run 26.2 consecutive miles in a grueling mental and physical test. Powell’s emotional reaction to completing the race wasn’t just about the run, though. It was also about the joy and relief of coming back up after hitting rock bottom. Running Away is the story of how one decision can alter the course of a life. Knocked down by a painful divorce and inspired by his father, Powell decided to change his mindset and circumstances. He moved to Boulder and began running in earnest for the first time in his life. Over the 26.2 chapters that follow, Powell grapples with his past relationships, gaining insight and hard-won discipline that give him hope for the future. There are many books languishing on my “to be reviewed” pile that I should be writing about but I’m letting Running Away muscle in both because if I wait until its proper turn, it’ll be a long time after I’ve run the Great North Run and won’t be nearly as relevant and because I have some grumbles that I’d like to air. The general reason I don’t read memoirs is that there are few people whose lives I am genuinely interested in. I like watching films as much as the next person but I have little to no interest in the lives of the actors in them. The people whose lives I am interested in are usually significant figures whose autobiographies are so long, I just can’t contemplate reading them until I have a long stretch of time off (like, retirement long). The Long Walk to Freedom, that includes you. The point being: I don’t usually read memoirs/autobiographies and Running Away has only served to reinforce the reasons why. It’s difficult to say why I so disliked Running Away without being insulting to the author, which I suppose is an inherent difficulty in writing review of memoirs (and another reason to steer clear of them in the future!). I’ll try and stick to the facts. Robert Powell cheated on his wife with her friend, left and subsequently divorced said wife, lost a not particularly lucrative job in journalism, cashed in on his 401(k) (which seems to be the equivalent of what we’d refer to as a pension in the UK?) and, rather than trying to find a new job or pursue something that he enjoys, moves to Boulder, Colorado (which is apparently popular with runners) to pursue a hobby that he doesn’t like just because his father was good at it. I could have got over the fact that I have nothing in common with a cheating middle-aged man lacking in both ambition and direction if the book had focussed on running in the way that the title and cover implied that it might. If you’ve looked at the cover and read the blurb and, like me, have thought, “Hey – I like running and I like to read other runners’ stories, I’ll pick this up”, think again. Much as it might like to be, Running Away is not really about running. There are some snippets about running and about famous runners and various races across America but it’s told by a man that doesn’t actually like running. Which is an odd tone because I imagine that the target audience are people that do like running. I wanted to be inspired and buoyed up through my final month of training, not reminded of how sometimes running makes your legs/back/everything hurt and that leaving the house super early to squeeze in runs even on a Saturday isn’t always the best. I’m sorry (really) but I completely lack the capacity to feel any kind of sympathy for someone who cheats, squanders a college (university) education that he was privileged enough to have, seemingly can’t be bothered to even apply for a job but feels entitled to moan about being single, living in slightly unpleasant sounding accommodation and not having any money. I also can’t get behind someone who (sorry again!) comes across as quite selfish. Without that sympathy (or even empathy, really), I struggled. When Powell arrives in Boulder, he doesn’t know anybody but is taken in by a wonderful sounding running club full of people who really are passionate about the sport. Not only do these people welcome him into their group sessions, one man commits himself to training Powell and spends what sounds like hours trying to encourage Powell, providing support when he was at a low point and generally trying to share his love of running so that another man can reach his goal. All for little to no thanks because Powell has taken up a hobby he doesn’t like and drags his heels about it when given half a chance. This is becoming a rant, isn’t it? Bottom line is: if other people give up even an hour of their free time to support you in achieving something, gratitude is in order. If people do that over a long period of time, serious gratitude is in order. Don’t throw it in their faces by lounging around and moaning about the thing they’re trying to support you in doing. And especially don’t then write about how much you hated the time that they spent trying to do you a favour. 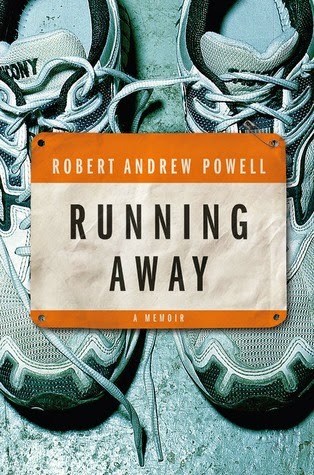 The problem with my moaning is that it isn’t so much about Running Away as a book but Powell. Putting aside the fact that I skim read large sections of the book to avoid becoming even more irate about cheating/lethargy/negativity, the writing was ok. There were times when I found the tenses to be a bit confused and the writing to be a bit repetitive but otherwise it was ok. Definitely not strong enough to carry the lacklustre tone, though, so still worthy of reasonable complaint. I think some strong editing would be improve things no end. So the writing was just acceptable, the author has made some dubious decisions and I imagine is difficult to get behind for a lot of people and the book isn’t particularly inspirational and it isn’t half as hopeful as the blurb would imply, largely because of the general hatred of running that seeps out. I finished it only because I wanted to see whether the author achieved their goal but did I enjoy it? In case it isn’t already clear by now: no. No, I did not. Overall: No prizes for guessing that I don’t recommend Running Away. If you run and hate it but really are committed to still doing it and want someone whose unhappiness you can share, maybe this is the book for you. If you run and like it? Skip it. Trust me when I say that it’ll only make you grumpy.